How good can those antique car headlights be? Disclaimer: While an effort has been made to assure accurate information, no guarantees are made. We are not responsible for any damage or injuries that may occur as a result of following these instructions. The only vehicle this has been tried on is a 1933 Plymouth PD. Applicability to any other vehicle is for you to decide. The headlights on the 1933 Plymouth were manufactured for Chrysler by Twilite and are fairly standard construction for the era. The headlights consist of a bulb, reflector and lens. The reflector came from the factory with a silver coating. Twilite supplied other manufactures including GM. The 1933 Chevrolet headlights have many parts that interchange with the 1933 Plymouth. And a number of GMC trucks up to about 1940 use the same lens as the 1933 Plymouth. 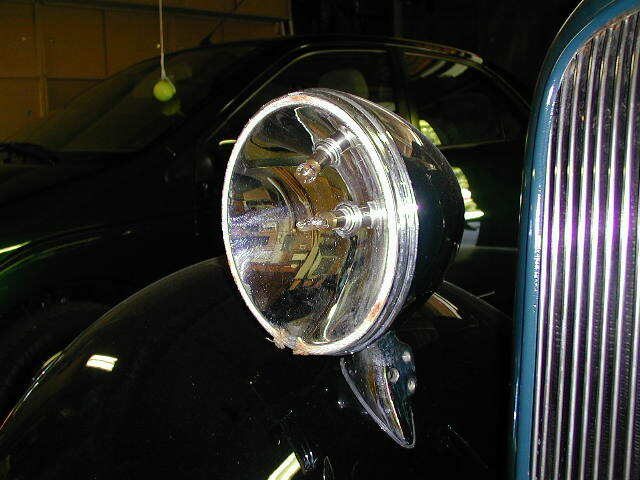 All Plymouths prior to 1933 came equipped with 1110 bulb that produce 21 candlepower (cp) on both high and low beam. 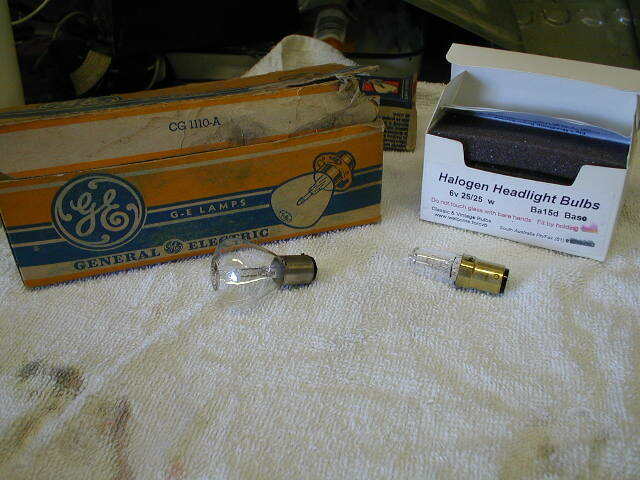 In 1934 the lower priced PF and PG also came equipped with this bulb. The 1934 PE came equipped with a 1116 bulb that produced 21cp on low beam and 32cp on high beam. The PE also had a voltage regulator, the first Plymouth so equipped. I do not currently have a reference showing the original bulbs for 1933 but suspect the PC and PCXX used the 1110 bulb. The PD may have been equipped with the 1116 bulb. In any case, the low beam would have been 21cp. I will concentrate on low beams here as that is used more than the high beams. Formed by lens. Formed by lens or by shaped reflector. 1Classic and Vintage Bulbs 25/25w bulb. There is no standard North American bulb number for this lamp. 3Based on design wattage and typical incandescent lamp efficiency. 4Based on manufacturer's claim of 50% to 70% increase over equivalent wattage incandescent lamp. 5Based on design wattage and typical quartz-halogen lamp efficiency. 6Bulb number from car owned by a Plymouth collector. Wattage from [Chrysler 1953]. Lumens based on design wattage and typical incandescent lamp efficiency. It is interesting to note that in the United States, headlight development was stagnant from 1940 until the late 1960s, an era during which highway cruising speeds increased from 50 MPH to 75 MPH. Even the change from 6 volt systems to 12 volt systems in the 1950s did not change the available lighting. In an original 1933 car there will be many decades of corrosion in the system. This corrosion will be both on the reflector and in the electrical system. It is absolutely necessary that these be attended to if there is to be any hope of getting decent light to the road. The original reflector coating was silver. Silver, when polished, is an excellent reflective coating. Unfortunately it tarnishes easily and needs periodic polishing. Polishing removes material. Because of the years of polishing it is likely that some of the base brass is now showing through the silver. Brass does not make a good reflector. When silver reflectors were in standard use most car lights were not maintained properly. I have seen estimates that on most cars the reflectors were only about 40% efficient because of lack of maintenance. 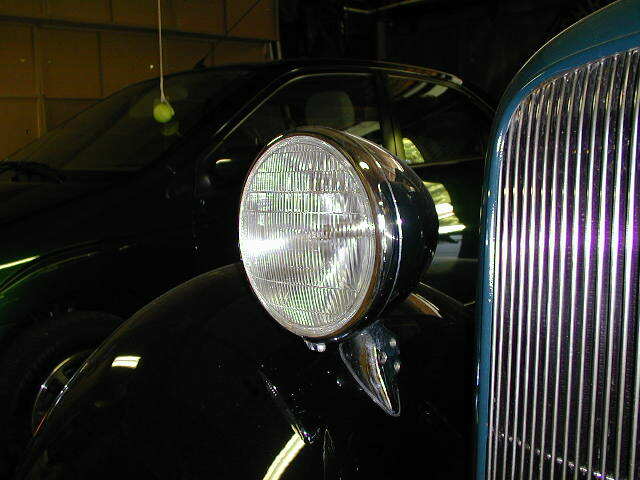 This was a major reason for the adoption of sealed beam lights at the end of the 1930s. At the very least, reflectors should be re-plated with silver. If you go with re-silvering, regularly inspect, clean and/or polish your reflectors. Peak light efficiency demands good reflector condition! Simply cleaning the reflector will often double, and sometimes TRIPLE, the efficiency of the headlamps. The reflectors are silver plated, and are very easily scratched. For this reason they should be very gently polished. It is possible to clean them satisfactorily with a mixture of alcohol and lampblack. The mixture is spread over the surface of the reflector with a soft cloth, and then wiped off with absorbent cotton after drying. The wiping should always be done from the center of the reflector to the edge, and never with a circular motion. Uvira is a company that will put a glass coated vapor deposited aluminum coating on antique car reflectors. This makes a maintenance free reflector that matches modern standards of head lamp manufacturing. I had my reflectors upgraded when I took the car apart about twenty years ago. They are still in perfect condition. The original system is driven by a 6 Volt battery and generator. Six volts systems are much more sensitive to voltage drops (bad connections and wires) than more recent 12 volt systems. You will find significant corrosion on the original wires, ammeter, and switch connections. This will cause high resistance problems that will reduce the voltage at the lights. We see a 80% reduction in power at the bulbs on a 6v system with only one ohm of unwanted resistance. The 6v system very sensitive to corrosion. Actually it may not be quite this bad as the filaments will be cooler at the lower voltage and thus offer lower resistance. There could be considerable heat generated where the unwanted resistance is located. This could also pose a fire hazard. In addition to replacing corroded wires, you should examine, clean, repair and/or replace all switches, connectors, etc. in the circuit. Riveted electrical connections and components can be secured with solder to provide good electrical bonding. Before cleanup, my headlight switch alone had about 3 ohms of resistance. After clean up it was down to 1 ohm. Rather than waste more time with it I found a bolt in replacement at the local auto supply that I modified to take the original knob. The $6 cost and hassle in re-threading the pull rod to take the original knob was rewarded by putting in a switch with no measurable resistance. As you see in the photographs above, it does make a difference. Most of the Plymouths of this era, indeed most cars of this era, were equipped with a “third brush regulated” generator. This generator acts as a constant current device with the output current depending on generator speed. For Plymouths, the maximum output was at about 25 MPH. System voltage should be constant. For the third brush system to work the battery is used to keep the voltage from going too high or too low. A bad ground on the battery will cause system over voltage and burned out light bulbs. In any case the system voltage varies considerably and is generally low when the lights are on and you are traveling at speed. You should keep you generator adjusted for the type of driving you are doing. This is difficult. There was a reason that “battery service” was a pretty big business for automotive garages in that day. You may want to install an electronic voltage regulator in your car to cut down on the abuse your battery takes and to assure sufficient voltage for high speed night driving. [Purvis 1932] talks of projecting a “solid wave” of light. The 1933 Plymouth seems to subscribe to this theory, the pattern is very horizontal with the sides of the road getting nearly as much light as the pavement ahead. Sealed beam light pattern. Most light directed down the road in very distinct spots with a less pronounced horizontal spread. Beam pattern very similar to 1933 Plymouth. The main difference is use of a total of 110 watts on low beam and 220 watts on high beam. There is no beam pattern show here because we no longer have that car to make a photograph. “U” shaped pattern with the passenger side receiving more light than the driver side. There is a very sharp cut off of the light on the top. While different than many current beam spreading patterns, it appears that the 1933 Plymouth pattern is adequate. [Purvis 1932] also talks of aiming the high beams so that they strike the ground about 200 feet ahead of the car. [Whitney 1941 32] Gives the average stopping distance of 193 feet for a car going 50 MPH with brakes in “first class condition” on dry level concrete. So, under the best of conditions when these cars were new 50 MPH was the maximum safe speed at night on high beams. Given a reasonable reduction to account for average road conditions, average brake conditions and average driver ability, a night speed limit of 40 MPH is probably reasonable. The raw light generation of the old units equipped with a 32 cp bulb and with a good reflector is less than the output of a older sealed beam low beam. And it is much less than the newer bulb and reflector systems. The stock headlights are not adequate for high speed driving at night. Given that the older car brakes are also not up to modern standards, night driving should be a much slower speed than in a new car. As mentioned above, it is possible to get the old reflectors resurfaced to modern standards. This will insure good reflectivity without endless maintenance. Upgrade from 32cp to 50cp bulbs. Upgrade to 55 Watt quartz halogen bulbs. Upgrade to 25 Watt quartz halogen bulbs. I am not sure this option really exists. I have yet to find a bulb number that has the correct filaments, base and shape and low beam rated at 50cp. The 1188 bulb is rated at 50cp high beam and 32cp low beam. This is probably as close as you will find, but it only helps you on the high beam. In any event, typical 50cp incandescent filament draw 5.7 amps compared to 32cp filament draw of 3.9 amps. Once you include dash and tail lamps the total lighting draw is 15 amps. [NAPA 1937 18] gives the maximum hot generator output as between 13 amps (PF and PG models) and 19 amps (P2 models) with the typical being 15 amps. The speed for this max current varies but is typically between 20 and 25 MPH. At higher speeds there will be a continuous discharge on the battery. You could probably run this in a P2 or later car equipped with a voltage regulator, but is is pushing the limits of a stock 1933 or 1934 generator setup, so I do not recommend it. There are kits for installing 6v quartz-halogen bulbs rated at 55 Watts into old bulb and reflector systems. This will bring the raw light output up to modern standards. The reflector needs to be modified for the bulb to fit. And the stock electrical system cannot support the 25 amp load these lamps would draw without significant modifications: The 20 amp ammeter must be bypassed for the lighting circuit. The headlight switch is also under designed for this load. Probably the best bet would be to install relays close to the lamps and to separately fuse the power feed from the battery to these relays. The stock generator will not deliver more than 15 Amps on a continuous basis, so it would need to be replaced with a higher output unit. Probably a single wire 6 volt alternator would be needed. These modifications cannot be easily hidden and so will detract from the original appearance of the car once the hood is opened. Classic and Vintage Bulbs has a 25 Watt quartz halogen bulb that is a drop in replacement for the number 1000 incandescent but claims to provides about 50% more light than the number 1000 lamp. This brings the light output up to 1960s-early 1970s standards. Classic and Vintage Bulbs also stocks a 35 Watt bulb which could bring total light output up to the low side of modern standards. This bulb would draw about the same as a 50cp bulb, so powering it with the stock 1933 or 1934 generator would be pushing things. If your night drive is at any speed and/or for any distance, you will run the risk of draining the battery. It would probably work acceptably in a P2 or later car. In my case, I have had my reflectors resurfaced by Uvira. I just installed a couple of 25 watt bulbs from Classic and Vintage Bulbs and am pleased with how they work. You can see that the stock appearance has not changed. The clothes line gasket is cheap but seems to work okay. LED bulb replacements are starting to appear on the market. On example is the “Double Dipper” bulb replacement from Classic Dynamo & Regulator Conversions in the United Kingdom that they claim produces about 600 lumens. I have not tried these yet, but that should provide the same light output as the Classic & Vintage Bulbs 25 watt quartz-halogen with much less current draw.